Spookily, not super garlicky... but very rich and delicious. What do the dead have to do with today's post, you might rightly ask. I'm not one to take chances, you see. There’s a vampire on the loose, maybe. At least that’s what some of the folks in the small remote village of Zarozje, Serbia believe. This story has been carried by all significant news wires over the last week. There’s rumours that a legendary vampire “ghost” has awakened and may be looking for a new home. It all started with the collapse of an old mill. For several decades it has been run by the same family as a tourist attraction. Recently, due to the lack of much needed repairs, it has fallen in. The owners say they were never inside for the whole time they owned it because of fear. It was purported to be occupied by Sava Savonic, Serbia’s most famous vampire ghost. Vampire ghost? Apparently he was caught and "staked" but his spirit managed to escape in the form of a butterfly. One with very large teeth, I guess. 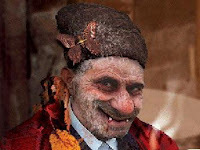 Sava is said to be one of the – if not the – oldest vampires in Serbian vampire lore. Sava would drink the blood of unsuspecting villagers who came to the mill to grind their grain. One would think it wouldn’t take a small village very long to realize they were losing all their millers… But anyway, the mill is now a pile of rubble, and so the rumour is that Sava may be a little peeved and looking for new digs. This ought to keep him away. 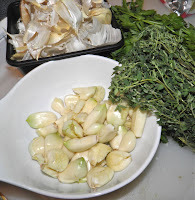 2 full heads of garlic. So everyone had better be on the lookout. Never a superstitious lot, the local council has issued an official public health warning for residents to rub their doorways and windows with garlic, and may locals have also placed crucifixes inside their homes. To add to the panic the winter season has moved in. So supposedly the vampire will be “living” in the cold all winter and looking for somewhere (or someone) warm – at least until spring when repairs can get underway. The economy’s in the toilet, the local attraction has fallen down… add one plus one… Potential tourist opportunity? Why not – Transylvania has been milking Dracula for over 100 years. By the way, area garlic sales have skyrocketed. I know it’s half a world away, but just to be on the safe side I decided to make a Balkan-inspired garlic-infused roast. 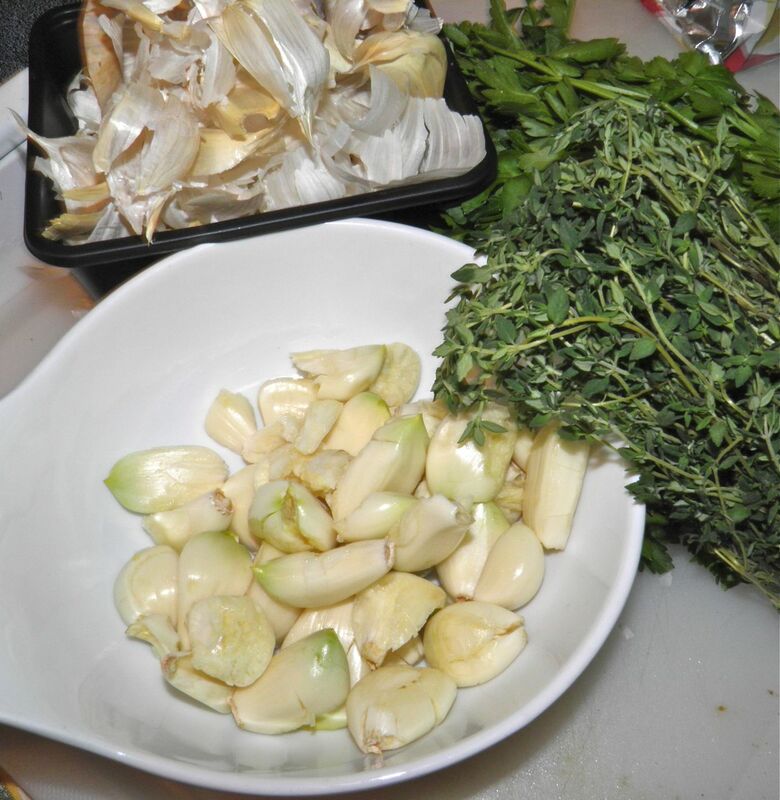 There’s enough garlic in this one to not only keep vampires away, but also loved ones who may be within 3-4 feet! This is actually based on a Balkan lamb recipe, but I’ve change it up considerably. So in honour of the residents of a small village in Serbia and a dilapidated mill, here’s my recipe. 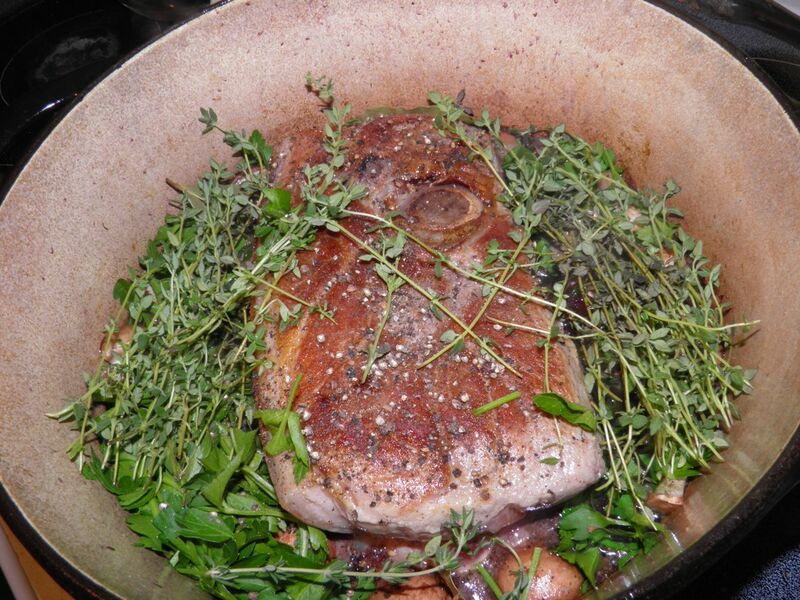 You'll notice that in the picture I have used thyme sprigs rather than just thyme leaves. If using fresh, estimate how many sprigs will yield about 1/4 cup leaves. Just remove the stems before thickening the gravy. Anyone who's ever removed thyme leaves from stems will know why this is a wise move. Suffice it to say, worthy accompaniments would be roasted and rustic, like anything you can forage from your root cellar. No need to carve this roast. It’s fall apart tender. Heat the oil in a Dutch oven, or other heavy pot with a lid. Brown the pork on all sides. 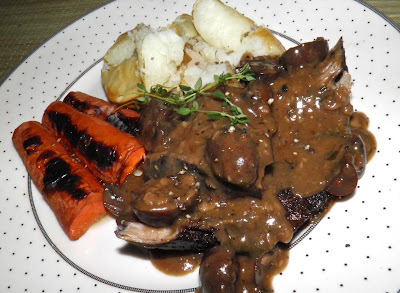 Scatter the garlic cloves and mushrooms around the meat. Add the liquids and then the thyme, bay, parsley, salt and pepper. 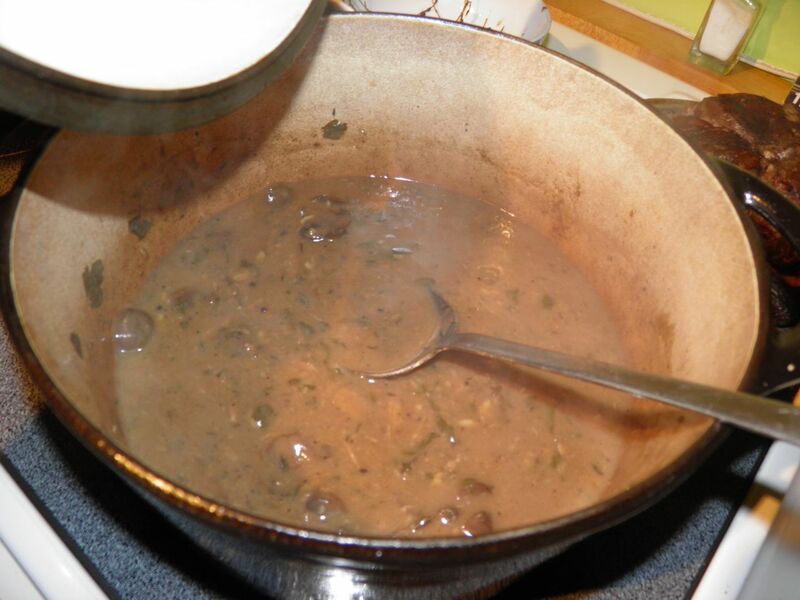 Bring to a simmer, cover and reduce heat to simmer. Cook—covered—for 2 hours, keeping check on the liquid level. After 2 hours, remove the pork and add the flour/butter mixture. Let the liquid thicken and serve on top of pieces of roast.